Create initial brand identity for clever grocery-comparison app. A logo that communicates the new power shoppers will have to compare what they previously couldn’t (ie: apples & oranges). An overall identity that emphasizes the freshness (green) and excitement (orange) of getting good deals every week on groceries. Gro­cer­Ma­nia is a web ser­vice based in south­ern Cal­i­for­nia. It tracks prices, spe­cials and coupons in local gro­cery stores to help con­sumers save mon­ey on their week­ly gro­cery shop­ping. We start­ed by ana­lyz­ing the idea and dis­cussing G-M’s needs: a logo and some ini­tial ads to excite poten­tial investors. We record­ed key facts and tried to diag­nose char­ac­ter­is­tics that this new brand would pos­sess. The logo would need to work in adver­tis­ing as well as on a web­site and app. We went through a num­ber of con­cepts and vari­a­tions on the logo. One ini­tial con­cept encom­passed the enor­mous pos­si­bil­i­ties the app intro­duced. Here we explored sym­bols that implied the mul­ti­ple options a shop­per would have with Gro­cer­Ma­nia. 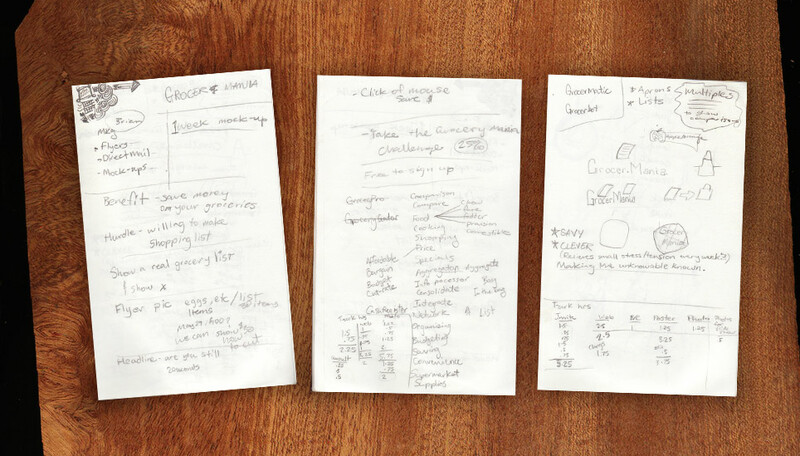 Notes, brain­storm­ing and sketch­es for Gro­cer­Ma­nia logo & brand­ing ses­sion. The win­ning con­cept involved a made-up fruit sym­bol – part apple and part orange. The app nul­li­fies the say­ing “you can’t com­pare apples and oranges.” With this tool, you can com­pare things that you nor­mal­ly wouldn’t. Like the best new infor­ma­tion tech­nolo­gies, Gro­cer­Ma­nia makes the unknow­able known: clever. With the brand iden­ti­ty begin­ning to fall into place, the Gro­cer­Ma­nia team began to work on their prod­uct. We helped in the areas of usabil­i­ty, brand style guid­ance, and car­ry­ing out ad con­cepts. 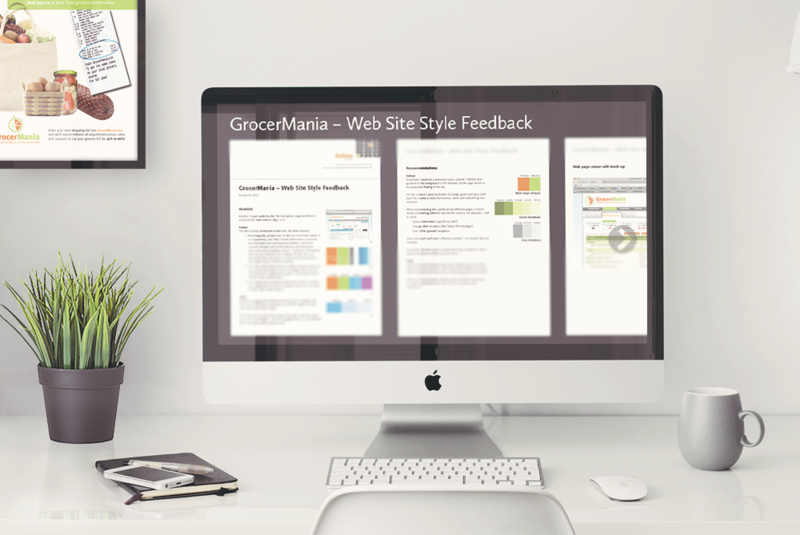 Our feed­back result­ed in a stronger pro­to­type and a more assured brand image Gro­cer­Ma­nia could use to pitch for back­ers. Brand iden­ti­ty visu­al style con­sult­ing for the Gro­cer­Ma­nia web site.